Dr. Muhammad S Feteiha, MD is a Doctor primarily located in Springfield, NJ. He has 24 years of experience. His specialties include Bariatric Medicine and Surgery. He speaks English. Dr. Feteiha has received 2 awards. The overall average patient rating of Dr. Muhammad S Feteiha is Excellent. Dr. Muhammad S Feteiha has been rated by 11 patients. From those 11 patients 3 of those left a comment along with their rating. 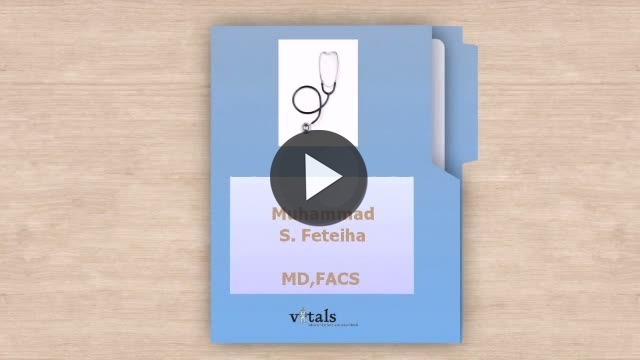 The overall rating for Dr. Muhammad S Feteiha is 4.5 of 5.0 stars. Bariatric medicine focuses on the causes, prevention and treatment of obesity. Bariatric specialists are trained in medically supervised weight loss and the management of obesity as a chronic condition. These specialists are skilled in various disciplines that help patients lose weight and obtain optimal health. The field encompasses dieting, exercise and behavioral therapy, anti-obesity medication, pharmacotherapy and surgery. Bariatric specialists might be from surgical backgrounds and perform obesity-related operations or they might be nutrition and hormone focused, prescribing diet and exercise plans as well as weight loss medications. Patients defined as obese or having unhealthy Body Mass Indices (BMI) have much greater risk of heart disease, diabetes, asthma, sleep apnea, hypertension, many types of cancer and chronic musculoskeletal problems. One subspecialty of bariatrics is the focus on the correlation between obesity and mortality. I absolutely love Dr. Feteiha and his staff. Everyone was so helpful and made my experience a great one. I am now on my way to accomplishing my weight loss goal and I couldn't have done it without the help from Dr Feteiha and his staff at ASA! Dr. Feteiha is a very compassionate and professional with a very pleasant attitude. His office staff on the other hand are very callous and cold. to refuse to speak to me or answer my question because i had an outstanding balance that i did not know about was wrong and that let me know that this practice has changed and is more concerned with 67$ then my well being lets me know that i should not ever go back their again. He fixed my (groin) hernia perfectly! My recovery was quick, and I got back to athletics in no time. I can barely see the scar he left! Although he's built a great reputation as an expert in Weight Loss Surgery, he's got a gift for all General Surgery. Take a minute to learn about Dr. Muhammad S Feteiha, MD - Bariatric Medicine in Springfield, NJ, in this video. Dr. Muhammad S Feteiha is similar to the following 4 Doctors near Springfield, NJ. Have you had a recent visit with Dr. Muhammad S Feteiha? Select a star to let us know how it was.